When working outside, for example on a roof, you and the fall protection system will have to deal with various types of weather circumstances. 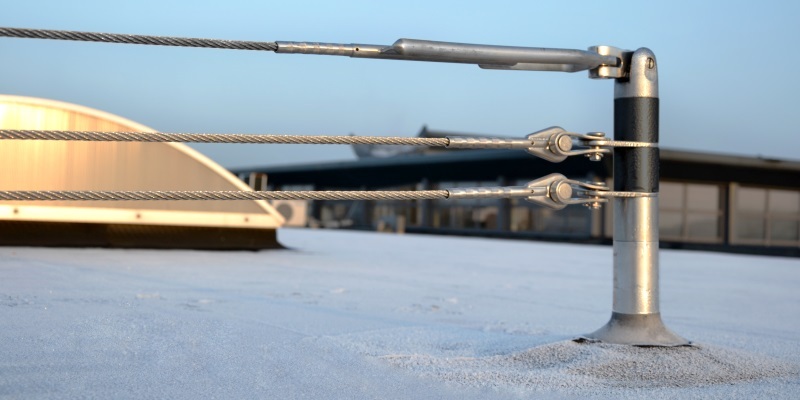 In this blog we will explain how (extreme) weather conditions can influence the use and functioning of various fall protection systems. And most important: how to deal with this. Is working at height allowed at severe weather? Let us start by stating that each country has its own regulations when it comes to working at height in certain weather conditions. Take snow for example: in some countries it is prohibited to work on a roof surface covered with snow or ice. But in countries where snowy weather occurs regularly, working on a snowy roof is the most common thing in the world. Always check the safety precautions that are drafted by the local legislators of the area where you are working in. How can the weather affect a fall protection system? Various types of weather have various types of effect to functionality and use of a fall protection system. This may not only be the case for permanent anchorage systems, but also for systems used in combination with fall protection PPE (such as temporary anchorage). Let us take you through a couple of these situations. In cold environments with freezing temperatures, a system made of stainless steel could easily freeze. Rotating anchors do not rotate and integrated energy absorbers could be iced up so it loses its functionality. If this is the case: never use any form of electronic or gas powered heathers to dry a fall protection system! You can further damage the goods and make it impossible to use them again. What you can do is try to manually remove as much icing as possible so the anchorage eye could rotate again for example. Dry the anchor points or previously frozen parts with a towel or cloth so the risk of corrosion is taken away. The same goes for environments where it rains a lot. Rain can cause corrosion, which is never a good thing when it comes to safety equipment. Of course, a fall protection system is designed for outdoor use, but to extend the life span of a product, you will need to maintain it. To guarantee the safety of people who use these systems, it never hurts to check it after a storm or (heavy) rain has passed. Look for loose branches or other debris that can block the access to your system or affect the user comfort. Clean your anchor posts or single anchor points with a dry towel or cloth so most of the dirt or filth is gone. Do not use a high pressure cleaner to hose down your fall protection materials! The power of this tool could damage the system or the roof surface. Every type of weather has its own effect on a system. We’ve taken a look at snow, icing and rain, but the same examples can be taken for the exact opposite of those: sun and heat. Basic physics learns us that temperature plays an important role to the form and strength of all types of metals. For the larger part, most permanent fall protection systems are made of metals: think of stainless steel and aluminum. When exposed to high temperatures for a longer period of time, metal parts will expand and the chance of deformation increases. The heat can weaken the components and make them vulnerable for easy damaging when, for example, someone runs into the system by accident. An integrated energy absorber could easily be activated which makes the system not suitable for use until it is repaired. A waste of time and money, so be careful when walking and working around a fall protection system in severe heat. Make sure you are aware of its location at all times so you won’t accidently collide with it in any form. When it comes to working at height, it all starts with proper preparation and instructions. A brief explanation or job transfer by the responsible party to the ones who are carrying out the work is an absolute must when it comes to safe working at height. Usually the supervisor (manager) on site takes a moment to explain the possible fall hazards on the job and how to use the applied fall protection systems and/or Personal Protective Equipment (PPE). During these instructions, the current weather conditions and additional risks should be part of the discussion. More on how to prevent fall accidents among workers by providing proper training and instructions can be read in a previous blog post. Because most fall protection PPE, such as a safety harness, always has to be stored by the user, the chances of influences by weather conditions are minimal. What could happen is that it gets wet due to rain or snow during work. If this is the case, let your harness dry on its own before using it again. Never use any form of electronic or gas powered heathers to dry a fall protection harness! The webbing could melt and cause a weakening in the harness. With the next use, after the harness has dried, perform the pre-use check. If it passes the check, you can use the harness. Unlike most fall protection PPE, a permanently installed system is continuously exposed to the elements. When a fall arrest or fall restraint system is permanently installed on site, it is not always possible to check it before entering a hazardous environment. Therefore, we always advice users of these systems to do a general visual check from within the safe zone to see if there are no damages or deformations to the system before further proceeding. Look along the system as far as you can from the point of where you enter the work area. Check for any signs of wear or damage to the lifeline or the anchors that are visible from your standpoint. Look out for heavy forms of corrosion that damaged the system. Check the visible anchors and/or integrated energy absorbers for activation. When you have assessed the system as safe, you can attach your lanyard to the system or nearest anchor point and start to walk in the direction of your intended work area. Once walking along the system for the first time since carrying out the pre-use check, be on the lookout for any form of damages or malfunctions which you couldn’t see from further away. We have created a leaflet with service and maintenance tips for fall protection systems in various situations. Download it for free to see what measures are needed to safely work with a fall protection system in various situations. How this happens and how to prevent it, we will explain in one of our next blogs. Stay tuned!